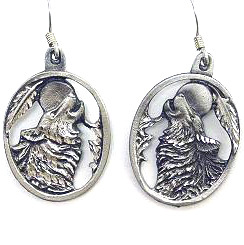 These howling wolf head earrings are cast in fine lead free pewter and have hypoalergenic french earwires. They are diamond cut for added sparkle. These wolf earrings measure approximately 3/4" wide x 1 inch long, not counting the ear wire. Hand crafted in the U.S.A. Only 5 left! However, this item can be combined with other earrings that are the same price to meet quantity discount levels. Our shopping cart will automatically adjust the prices in your shopping cart when a new discount level is reached. A matching pendant and bracelet is sold separately. This item can be shipped internationally.